Blood is the fluid which circulates throughout the body carrying nourishment and oxygen to the cells and tissue, and at the same time takes away waste matter and carbon dioxide. It is made up of plasma, red blood cells (erythrocytes), white blood cells (leukocytes), and platelets. Blood circulates through the body's heart, arteries, veins, and capillaries, which jointly comprise the circulatory system. Several times in the Old Testament blood is referred to as being, or containing, the life of a creature. Another mention is Leviticus 17:11 . 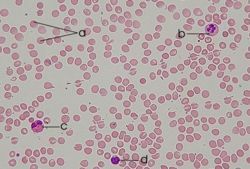 Human blood smear: a - erythrocytes; b - neutrophil; c - eosinophil; d - lymphocyte. Blood is composed of a liquid called plasma and cellular elements, including leukocytes (white blood cells), thrombocytes (platelets), and erythrocytes (red blood cells). The normal adult has approximately six liters of blood and comprises about 7% to 8% of the total body weight. Plasma makes up approximately 55% of the blood volume, the erythrocytes makes up about 45% of the volume, and about 1% of the volume is composed of leukocytes and thrombocytes. Plasma is a portion of the blood, which is a straw colored clear type of liquid. This liquid is comprised largely of water in which dissolved ions, proteins, carbohydrates, fats, hormones, vitamins, and enzymes are suspended and circulate throughout the body. The platelets, which help with blood clotting are carried by the plasma. Without platelets one could bleed to death from common injuries. It is the river of life and provides transport for oxygen from the lungs to the body tissue and carbon dioxide from the body tissue to the lungs. There are four basic blood types, and they are O, A, B, and AB. We know that our blood type is determined by the "alleles" that we inherit from our parents. For the blood type gene, there are three basic blood type alleles: A, B, and O. We all have two alleles, one inherited from each parent. The possible combinations of the three alleles are OO, AO, BO, AB, AA, and BB. Blood types A and B are "co-dominant" alleles, whereas O is "recessive". A codominant allele is apparent even if only one is present; a recessive allele is apparent only if two recessive alleles are present. Because blood type O is recessive, it is not apparent if the person inherits an A or B allele along with it. High blood pressure (also called hypertension) is a serious illness that affects nearly 65 million adults in the United States. It can cause life-threatening illnesses like kidney problems, stroke, heart failure, blindness, and heart attacks. It is often called a "silent killer" because many people have it but don't know it. Over time, people who do not get treated for high blood pressure can get very sick or even die. Anemia (uh-NEE-me-uh) is a condition in which a person’s blood has a lower than normal number of red blood cells, or the red blood cells don’t have enough hemoglobin (HEE-muh-glow-bin). Hemoglobin is an iron-rich protein that gives blood its red color and carries oxygen from the lungs to the rest of the body. In sickle cell anemia, a genetic disorder causes a lower-than-normal number of red blood cells occurs because sickle cells don’t last very long. Sickle cells die faster than normal red blood cells, usually after only about 10 to 20 days. The bone marrow can’t make new red blood cells fast enough to replace the dying ones. The result is anemia. 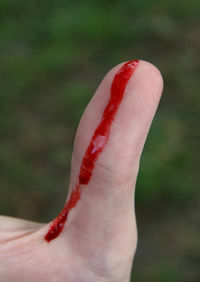 A number of microorganisms can be found in blood that cause disease (pathogenic). In humans, these pathogens include, hepatitis and human immunodeficiency virus (HIV). ↑ 1.0 1.1 1.2 1.3 What Is Sickle Cell Anemia? by the National Heart Lung and Blood Institute. ↑ Fact sheet--High Blood Pressure by the U.S. Food and Drug Administration. ↑ Bloodborne Pathogens by the U.S. Department of Labor. This page was last modified on 11 April 2013, at 14:09.